It is customary in certain circles to read Pirkei Avos every Shabbos afternoon during the summer months. One year, when I was probably 11 or 12 years old, we were visiting Crown Heights when we read this Mishna. As I read it, I wondered why Chazal contrast Avraham to Bilaam, when it would seem that there would be better candidates. First, Bilaam was known for his prophetic abilities, and while Avraham Avinu was certainly also a prophet, Moshe was known as the greatest of all prophets. So, wouldn’t Moshe have been a more fitting polar opposite? Moreover, Moshe and Bilaam lived at the same time, while Avraham lived a good number of generations earlier – again causing me to scratch my head as to why the Mishna seems to place the two as the opposing camps. I was left thinking that a more fitting contrast would have been either Avraham and Nimrod, or Bilaam and Moshe. I then did what any 11 or 12 year old would do: I asked the guy next to me. I didn’t know who he was – just a guy with a grey beard sitting in 770. "Tell me: What made Avrohom so special? What was so unique about him? Don’t forget that Hashem wasn’t a secret – The great flood was common knowledge. Noach was everyone’s ancestor. Yeshiva Shem V’Ever was standing. It would seem that all Avraham did was reinvent the wheel by recognizing Hashem." I didn't answer. I just stared at him like a deer in headlights. “Well, the difference is what we call Da’as. It mattered. Of course, it mattered to others before, however, to Avraham, it was different. Avraham desired to have a relationship with a real G-d. He couldn’t view the sun as G-d because he could not comprehend life at night without G-d once the sun had set. And he couldn’t view the moon as G-d because he could not comprehend during the day without the moon's presence. People told Avraham, 'Pray to many gods!' But that just wouldn’t cut it for him. For Avraham, G-d was real; He mattered; he couldn’t just take a laid back, “it’s all good” approach to such an important matter. And that’s what it means to truly know something – there are many things that we know in theory – but to truly “know” - to have da'as - is to change one’s life accordingly. On the other hand, what do we know about Bilaam? We know that Bilaam recognized Hashem as well. In fact, Bilaam even stated that he had to act in accordance with G-d’s will – indeed, this is how he was a prophet. So, what was special about him? His specialty, Chazal tell us, is that he was able to know when G-d’s attributes of severity were engaged, and take that opportunity to curse effectively. His knowledge of G-d was such that he knew what was taking place Above to a degree that enabled him to use it for his own benefit. Now we can see how they differed. Avraham knew Hashem and it mattered to the degree that he changed everything in his life to be a vessel for G-dliness. Bilaam also knew Hashem, but instead of changing himself, he took the opposite approach he used G-d to promote his twisted immoral self." The key here is that they represent polar opposites in this way: They both came to recognize the truth and while one changed himself accordingly to promote that goodness and truth, the other used that truth in a self-serving way and promoted evil. And this message is what Chazal want to communicate to us: To truly be a religious Jew, we can’t live in compartments. Da’as means that our beliefs permeate our being. If so, then our religiosity is recognizable and it will be reflected in “a generous eye, a humble spirit and meek soul.” That is so because our concerns are directed towards G-d, not our own self. 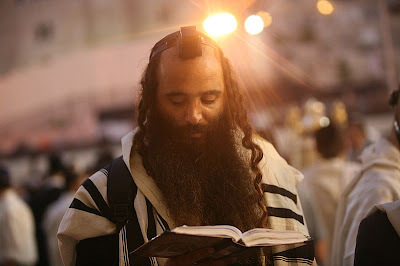 On the other hand, in as much as we may display jealousy, pride and haughtiness, we remove ourselves from Avraham Avinu’s camp and reveal that we’ve taken some lessons from Bilaam. Avraham used it to do HaShem's will, without reservations or preconditions. This is the Jewish attitude. Bilaam used it to try to manipulate HaShem to help him carry out projects for clients. This is the pagan attitude. This also shows that one's basic attitude going into an encounter with the truth is very central. Awesome. I think Bob's comment ties in great. blessings. thanks for the article. its very explanatory. Thanks for the deep thoughts. Have a great day. One cannot manipulate Hashem... rather he commands things to continue to happen in a natural fashion, according to his will. Hashem's attribute of severity is also the attribute which dictates nature. The name "Elokim" refers to severity, and it has the same gematria as the word hateva, meaning "the nature." I said "try to manipulate" because that was Bilaam's intention, the same intention that pagans have in general. Such manipulation is actually impossible, so Bilaam's method had a major conceptual flaw. Whatever Bilaam did accomplish was only because HaShem (for His own reasons) wanted to allow it to happen. By the way, people who try to use segulos as "magic", and not in the spirit of doing mitzvos, may have a similar misconception. You're absolutely right; I completely agree with you. My comment above was in response to Ilan.